The first roundabout in the world to contain a laser was opened on Wednesday 10th November 2004 by leading British actress Charlotte Rampling. 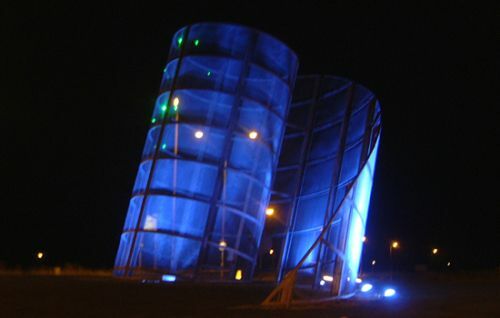 Designed by London sculptor Rob Olins, the structure on the gateway roundabout at the entrance to Haverhill from Cambridge stands over 11 metres tall and is lit by blue sodium lights in addition to the laser. Richard Herbert, chairman of the Haverhill Enterprise 2000 business group, said "the Spirit of Enterprise makes a bold statement for the town." A large crowd braved the cold and wet conditions to watch Charlotte Rampling conduct a countdown to the formal switch-on. When she pressed the button, the laser beam shone on the sculpture, while the floodlights from Parkersell gained slowly in intensity until the whole piece was bathed in a blue light. A spectacular laser and sound show from Laser Innovations then entertained the waiting audience. Rob Olins, who designed the sculpture, also spoke, praising the input that he had received from the students at Samuel Ward and Castle Manor Sixth Forms, as well as the co-operation forthcoming from the town's businesses. "My brief was to ensure that the people and businesses in Haverhill had an input into what was being created" said Rob "so we held both workshops and exhibitions in the town to invite comment." Local businessman Christopher Gurteen, whose company donated to the scheme, said: "This world class design has generated immense publicity for the town. Love it or hate it, it will be a talking point for years to come." Charlotte Rampling was born in Haverhill and after her early film success moved to France. She was awarded the OBE three years ago, and was until recently married to Jean Michel Jarre, whose music formed part of the laser show. The £100,000 project has been financed mainly by businesses operating in the town, who have contributed over £60,000 in cash and in kind, and the project received a £22,500 grant from the Arts & BusinessEast New Partners Scheme. St Edmundsbury Borough Council were responsible for all the groundwork infrastructure of the roundabout.